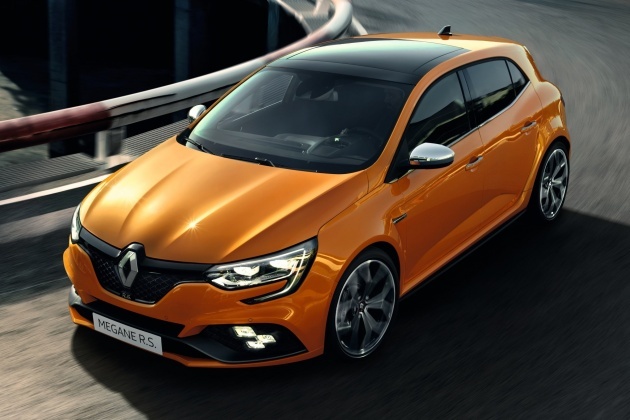 The new Renault Megane RS has been leaked more times than water through a colander, but the new Gallic hot hatch has finally been given its official unveiling. As expected, there’s more power than before; however, the fourth-generation model has also been given a whole host of new technologies to go with it. A downsized 1.8 litre turbocharged and direct-injected four-cylinder engine produces 279 PS hp and 390 Nm of torque, five horsepower and 30 Nm more than the outgoing model had at its peak – and it’s all still sent to the front wheels. Keeping the extra helping of performance in check is the 4Control four-wheel steering system that made its debut on the latest Megane GT. Purists will rejoice at the fact that, unlike the dual-clutch-only Clio RS, you can still have a back-to-basics six-speed manual gearbox here, although a six-speed Efficient Dual Clutch (EDC) transmission is also available if you like your pocket rocket with paddles and two pedals. 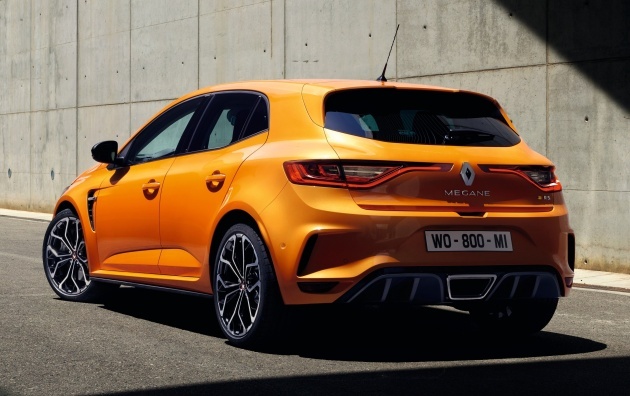 As is usual for a Renault Sport product, the new Megane RS comes with either the standard Sport suspension or a more track-focused Cup chassis, both receiving rally-style four hydraulic compression bump stops for better handling or comfort depending on the chosen setup. The front suspension has also been completely redesigned with an independent steering axis for improved precision, while the Cup gains a Torsen limited-slip differential. Renault’s Multi-Sense system provides a choice of five driving modes – Comfort, Normal, Sport, Race and the customisable Perso. With greater performance comes a heap of added visual aggression, headlined by the wider track and 18- or 19-inch wheels. Large front air intakes with a three-dimensional honeycomb mesh feed more air to the more powerful engine, and are outfitted by RS Vision LED daytime running lights. Fender vents sit aft of the front wheels within wider front fenders (the rears are wider, too); around the back, you’ll find a downforce-inducing rear spoiler and a diffuser with an integrated central exhaust. Inside, there are sports seats with integrated head rests, upholstered in either either fabric or Alcantara charcoal grey trim and finished off with contrasting red stitching. The “base” 280 hp model is just the start in what will inevitably be a long line of hot Meganes – an even more potent 300 hp Trophy version will be introduced at the end of next year. Amazing how research and hardwork can produce 280 bhp from a mere 1.8. I wonder what our Proton engineers do? Don’t you guys try to research how to increase bhp in engines whilst improving economy and FC? Cause our Proton cars, the same engines will be in the model for 10 years. Also, any news what will happen to the hundreds of millions spent on engines for Proton by Petronas? The engines are ready but Proton cannot take it now cause Geely won’t like it. Who will pay Petronas compensation for developing those engines? Bro, if Proton can do that, Renault will never win the F1 championship back in 2005. And you will not see so many Myvis on the road. Dey kunta kote, wtf does this Renault have to do with Proton? Typo in the last paragraph. Should be 280hp instead of 380hp. Writer’s wishful thinking perhaps! Aha, yes, well-spotted – we’ve been rushing out the Frankfurt stories today and I missed this error earlier. The article has been amended. That’s it. I am selling my WRX for this Megane…..
Dis pretender only can admire rear of A45amg. Cannot compare 1.8 with a 2.0 engine la. The A45-AMG also have more than 90 HP over the Megane. The AMG price is definitely more expensive(over 150k) compare to this Megane RS. heskey- But the amg45 suffers from reliability and turbo problems. Also it does not handle as great as the megane. Also it cost Rm 150k more and maintenance cost a bomb. I think I like this better than the Civic Type R.
The only thing stopping me from buying a Megane is the RV. So expensive. Poor ppl like me who browse through the used car market can’t afford. Bro, poor people like U & Me should be driving a small car that is cheaper to buy & maintain. Maybe we should work harder to upgrade after 3 years. OK?! wow is that an illuminated antenna? that’s so cool! the paddle shift look tuakong.